Gilbert is expansive in her definition of the “creative,” and insists that writing is only one of many such endeavors available to anyone who wants to take up anything from, say, raising goats, or cross-stitch, or perhaps making quilts to sell on, well, Etsy. Still, given her experience, what she returns to most often is the world of writing. In that sense, Big Magic is Gilbert’s first book-length foray into writing about writing, a profession she has been a part of for nearly twenty-five years. Gilbert is also an enormously successful writer — according to The Daily Beast’s Lauren Streib, she has “easily” made $10 million in royalties just from her 2007 blockbuster bestseller Eat, Pray, Love: One Woman’s Search for Everything across Italy, India, and Indonesia. We can assume that it is the phenomenal success of that book which made Gilbert so successful on the TED circuit and why so many are so eager for her advice. In a time when the “creative” fields are diminished in value but also seen as potentially profitable and simultaneously good for you, it is inevitable that millions would tune in to see what a best-selling author might have to offer them in terms of advice on how to emulate her example. The line she walks in this new book is a fuzzy one: Gilbert wants to seem assured in conveying she has insider knowledge about her field, but she doesn’t want to acknowledge that being a writer is actually a profession. To do so would demystify her entire career and, really, mean that hers would be no different than the many books lining bookstores everywhere, promising everyone the best-kept secrets to publishing or the “creative life.” So, instead, she presents, in Big Magic, not a description of how to become a writer but how to be a writer. This is entirely in keeping with the message of Eat, Pray, Love, which similarly swept aside any material considerations—how, exactly, are women to embark upon epic journeys across the globe without independent and very large means?—in favor of a can-do quasi-spiritual set of injunctions about uncovering one’s true self. Because Big Magic is in so many ways an addendum to the earlier text, it becomes a case study of how a hyper-successful writer conceives of herself and her profession. In the end, Big Magic is not about actually helping people become better at creating work. Rather, it’s about furthering the informal literary empire spawned by Eat, Pray, Love. That’s not to say that Big Magic is entirely without merit. Gilbert offers many useful checks against the unnecessarily dramatic stereotypes people are apt to immerse themselves in when they look for the creative life, such as the one that dictates that genius can only emerge from tormented lives. She calls for discipline in turning out work even when it seems impossible to keep at it. All of that is necessary advice—in a world where writing and/or creative work is as fetishized as it is ill-paid, it’s useful for those looking to create over the course of a lifetime to know that some myths are best abandoned. Despite such helpful admonitions, most of Big Magic reads like carnival puffery from a fortune-teller. Gilbert combines Oprah-esque pithiness with strange, bizarre suppositions that render her the Deepak Chopra of Creative Work. And when I refer to magic here, I mean it literally. Like, in the Hogwarts sense. I am referring to the supernatural, the mystical, the inexplicable, the surreal, the divine, the transcendent, the otherworldly. Because the truth is, I believe that creativity is a force of enchantment—not entirely human in its origins. Writers/creators across the ages have attempted to describe the creative process and how it takes hold of them. But to describe it as “otherworldly” and “not entirely human in its origins” in the first quarter of the twenty-first century dissociates it from the material realities in which it takes place. It is inevitable, given the title of her book, that Gilbert should deploy this kind of language. But it is also disingenuous given that she also criticizes creative workers for being unrealistic about their writing practices. I believe that our planet is inhabited not only by animals and plants and bacteria and viruses, but also by ideas. Ideas are a disembodied, energetic life-form. They are completely separate from us, but capable of interacting with us—albeit strangely. Ideas have no material body, but they do have consciousness, and they most certainly have will. Ideas are driven by a single impulse: to be made manifest. And the only way an idea can be made manifest in our world is through collaboration with a human partner. It is only through a human’s efforts that an idea can be escorted out of the ether and into the realm of the actual. In other words, ideas are entities looking for the perfect home in the bodies and minds of creators. To support her theory, she gives an example of a novel she once planned to write, about Brazil and rainforest development. Due to various circumstances, she eventually stopped researching and developing it. In the meantime, she became friends with Ann Patchett, a fellow writer whom she first met at a conference. The two women bonded instantly, with Patchett landing a loving kiss on Gilbert after their panel. They became epistolary friends as well, exchanging handwritten letters where they discussed their lives and work. Somewhere along the way, it transpired that Patchett, too, was considering a novel about Brazil with similar themes. But it was only when they met for breakfast one day that Gilbert discovered Patchett’s work bore striking similarities to her own, down to their both including a protagonist who was a spinster from Minnesota. From this coincidence, Gilbert decides that her theory is right: she had stopped working on the idea and it, presumably in a huff, floated off to take residence within Patchett’s mind instead. Somehow, it never seems to occur to Gilbert that perhaps such a close friendship had to have resulted in some kind of basic symbiotic intellectual relationship. Instead, she decides that it confirms that ideas are like spectral beings that leap from body to body, seeking the ones that will put them forth into the world. Such reductive and, really, bizarre assertions about the creative process seem out of place in a book that lays claim to helping readers get away from other myths, like the one about tormented genius. But they are in keeping with the mystical premises of Eat, Pray, Love. That book redefined self-help literature for women. It has, and I think rightly, been criticised as “priv-lit,” dwelling too much on lifestyles only attainable by those who can afford to take a year off and travel in relative comfort, as Gilbert did. Jessa Crispin locates Gilbert’s memoir in a long tradition of inward-looking female, white memoirists who travel through foreign lands without ever considering the cultures they march through with depth or curiosity. Despite many such criticisms, the book has made Gilbert that rare thing, a multimillionaire author who will never again have to worry about financing her work. Gilbert will always be defined as the author of Eat, Pray, Love. Even the republished version of her 2002 biography of Eustace Conway, The Last American Man, has her authorship of that memoir clearly noted on the front cover. For some authors—Harper Lee comes to mind—the enormous success of a first book can become an albatross, an achievement that clouds and freezes one’s sense of movement as a writer. But Gilbert, to her credit, has continued to write. After Eat, Pray, Love came a sequel of sorts, Committed, about the reasons why she decided to marry the man she wrote about falling in love with in the best seller. Sales were respectable, but it saw nothing like the success of Eat, Pray, Love (arguably, what could?) In 2013, Gilbert returned to fiction, and published a tome of a novel, The Signature of All Things, which received positive reviews. The Signature of All Things was written with the luxury of time and place. Gilbert bought the largest and oldest house built on the tallest hill in artsy Frenchtown, New Jersey. She had the enormous attic fitted out with bookshelves and secret cabinets designed by the well-known carpenter Michael Flood. Her custom-made desk was built out of a 15-foot long slab of acacia. But the book also meant a return to intensive research, three years spent studying arcane histories of herbs and biology. Elsewhere and in Big Magic, she talks about the process of the work that went into it, filling up boxes with note cards, producing a 70-page synopsis before she even began writing the book. None of this comes to Gilbert as a set of recent habits: she has always been a writer. As she describes it in Big Magic, she grew up on her parents’ Connecticut Christmas tree farm (her father was a Chemical Engineer who grew the trees on the side, and her mother a nurse of Swedish descent) and she and her sister had no television growing up but were encouraged to read and write and to create their own worlds. According to Gilbert, she took vows early on, actual vows, to do everything she could to become and stay a writer all her life. She moved to New York to attend New York University and received a Bachelor’s in Political Science. This is the point at which Gilbert’s account of her writing life (told not chronologically but in terms of themes woven through the book) in Big Magic varies significantly from the reality that she has alluded to in prior work. It’s not so much that she lies, exactly, but that she engages in strategic acts of omission. 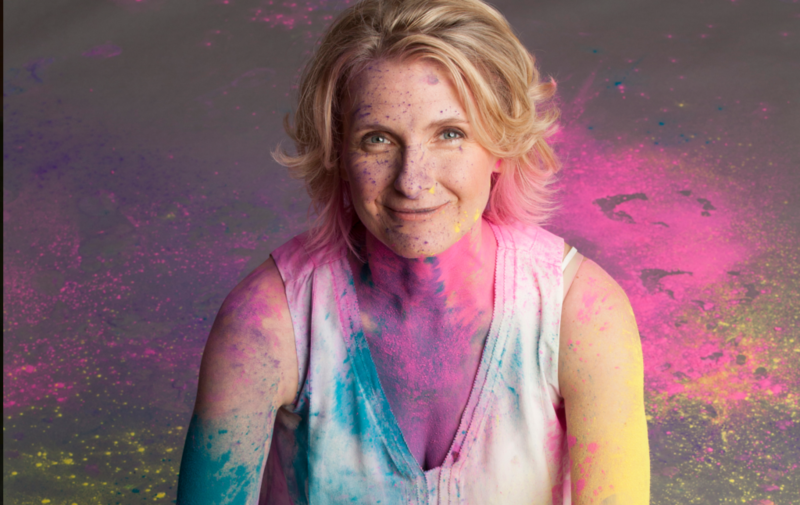 In Eat, Pray, Love, she admits to being a highly successful freelance writer. In 1993, she became the first unpublished short story writer to appear in Esquire since Norman Mailer. A 2013 New York Times profile notes that her editors still remember with “reverence” the skill apparent in her work, and she was widely published in the top magazines like GQ. Her GQ story about the Coyote Ugly Saloon became the basis for the hit film about the bar. She made enough money that she lost a considerable fortune in her divorce. All three of her first books either won awards or accolades from sources like The New York Times. There has never been an idyllic time for writers, but in the 90s, during the time that Gilbert flourished, writers who made it to the upper echelons of the top magazines could make a decent or even excellent living from writing. The proliferation of internet publishing and related factors have since changed and exploded all that. In light of all this, Gilbert could have written a very different and more realistic book. She could have retained the advice about discipline and plugging away, dispensed with the hoo-ha about ideas as beings and provided a more realistic view of what it takes to become a successful writer/creative producer like her. I once wrote a book that accidentally became a giant best seller, and for a few years there, it was like I was living in a hall of fun house mirrors. It was never my intention to write a giant best seller, believe me. I wouldn’t know how to write a giant best seller if I tried. She also goes on to write, “It never occurred to me that my own thoughts and feelings might intersect so intensely with the thoughts and feelings of so many other people.” This is simply a lie: unless she had the cachet to get away with not writing one, publishing houses generally demand book proposals before committing to publication. Pitching a book—and receiving such a large advance—is entirely about revealing exactly why the “thoughts and feelings” of the author might coincide with her readers. Even if she didn’t have to produce one, Viking would have at the very least asked for some sense from her as to why the book mattered enough at that particular time for them to publish it. In which case, Gilbert would have had to provide at least a perfunctory sense of her target audience and why they would want to buy her book. In other words, Eat, Pray, Love was not some mere accident but a well-planned intervention into the zeitgeist of publications by and about women. There’s nothing wrong with that, but the success of Big Magic—the potion that Gilbert is trying to market as “magic”—would never come about if she blithely and carelessly went off on a mysteriously funded jaunt across the world. Rather than convince the reader to anthropomorphize every aspect of the process, it would have been more honest of Gilbert to point to the structural, procedural elements of it—that you don’t just get a book contract like the one she received for Eat, Pray, Love without an agent and a few lawyers, for instance, or that book proposals are necessary and hard work. From the volume of complaints that emerges from the professional creative class, you would think these people had been sentenced to their vocations by an evil dictator, rather than having chosen their work with a free will and an open heart. In other words, Gilbert, who has spent half her life as a professional writer, now believes that hers is simply a vocation. Yet, when she actually describes the trajectory of her career—and it has been a long and illustrious one—she treats it not as a mystical calling but as work. At one point, for instance, she relates how her editor at GQ, where she was then a staff writer, pulled a story she had worked on for five months, a travel story about Serbia on which the publication had spent a lot of money. The editor’s rationale was that he realized she was not the person for the job and there was no point in her pursuing it any further; he told her to simply move on to the next assignment. Gilbert’s point in relating the anecdote is that writers must always be prepared to end projects that aren’t working. But we might glean a different story here: that no one hires a casual, vocational writer to work on a travel story about Serbia for five months. The freedom to flit, to cut one’s losses and move on, is possible only when one has the backing of a serious institution and serious money, plus an editor who can sign off on half-a-year’s salary and travel expenses for a project that never sees completion. In fact, this is one of the dominant threads in conversations about the breakup of media outlets: that fewer places are able and willing to develop the kinds of writers who can do sustained long-form writing, and that this has been a negative for media in general. Gilbert displays no awareness of or interest in these changes, even as they fundamentally diminish the possibility of following her advice and becoming the kind of liberated, magical creative spirit she insists all writers should be. This is yet another way in which Gilbert sidesteps the institutional and structural questions currently haunting the landscape of the creative fields—similar problems are rife in, say, dance or art—in favor of aphorisms designed to make the reader feel that she has been immersed in a spa offering creative well water as a lubricant for the soul. Yet, everywhere, in the arts, people are revolting against what they forthrightly call the exploitation of artists. In January 2016, the bestselling British writer Philip Pullman resigned as patron of the Oxford Literary Festival, citing the event’s refusal to pay featured writers as his reason. In New York, the Freelancers Union is gaining steady momentum as it collectivizes writers, arguing not just for fair but timely compensation. The current writing economy is generally inhospitable for those who want to write for a living, even though there are some changes afoot, like the kind described above. Gilbert occupies a rare stratosphere of the creative world, but it took her years of hard work to get there, and in a time when writers were paid decently. In a non-Gilbertian world, the average writer is a freelancer (given how many magazines have cut their budgets) who has to hang on to editors like a bulldog on a mailman’s leg just to get tiny checks mailed to her. The utter instability of writing as a profession has meant that a long and steady career like hers is unlikely, no matter how much determination one brings to the effort. Gilbert is clearly an intelligent and well-read woman, and has to be aware of these shifts. But she doesn’t really have to care about reality. Big Magic will undoubtedly make her big money, and while it’s not likely to become a high-grossing film (the concept of ideas as amorphous supernatural beings does not quite make for the same cinematic experience as Mumbai sunsets and Italian dessert tables), it will probably be incorporated into book clubs and become a teaching tool for a particular subset of women. Gilbert makes a point of saying that the money is not the point, but offers little to explain how someone with, say, multiple jobs and unstable shifts might carve out the time and the energy to continue with creative work. As with Eat, Pray, Love, Gilbert isn’t interested in the reality of lives different from hers. Rather, she sells the idea that everyone can access her kind of success by magic. In 2014, Gilbert sold her famously well-appointed house, telling the New York Times that she always had to move from a place once she had started and finished a project there. And so, the bookcases, the furnishings, even the imported statuary in the gardens, all of it was for sale for $999,999. It’s lovely, truly, that Gilbert has the financial resources to do so, but she appears to have lost a sense of the reality for many writers, who generally stay put in the same place and are barely able to make rent. Without getting into any crude analysis of class politics, surely we can ask the simple question: if any place and a routine and discipline are all that’s required for a writer, why does Elizabeth Gilbert require such majestic spaces to write in? Or we could ask an even simpler question of Gilbert, who scoffs at the very idea that the creative world should ever offer a living or stability: why shouldn’t someone who works tirelessly on a piece for, say, five months, expect to get paid really well for it? Or even to be able to earn enough for rent? Gilbert can afford to believe in theories of creativity as magic, and wax on about the arrogance of creative workers who expect to make a living off their work—now that she has accumulated a small fortune of her own. Ultimately, Big Magic isn’t really aimed at the “creative class,” but at a very particular kind of woman, a female consumer who wants to spend her money on a promise of a different life. In her acknowledgments, Gilbert thanks several people, but also thanks Etsy. It’s fitting; Etsy, like Gilbert, is a purveyor of goods with a quirky, homemade but polished aesthetic, professional goods given a carefully-honed sheen of amateurism. Etsy’s visual cousin is Pinterest, a website that would have been inconceivable at the dawn of the internet: a visual repository of images of, well, things. Need to know what a painted wooden blue table could look like, in fifty different shades and sizes? There will be a hundred images for you. Pinterest is ostensibly for the hobbyist — the idea is that you find, say, an image of a painted blue table and proceed to buff and transform that five-dollar table you found and carted home from the garage sale last summer. But the truth is that what Pinterest offers most is a fantasy of what your imagined world might look like. If you’re like most people, your table will not be transformed. You might daydream about spending days lovingly sanding it and turning it a blue pastel, but the realities of life and work will intervene. Your table will collect dings and scratches over the years and become at best a larger holder of keys and the detritus of your life. Finally, one day, when you get ready to move, you’ll look at it and decide it’s too much trouble to take an unremarkable brown table with you. It will be stacked neatly against your dumpster, to be found by a delighted neighbor walking by, who will take it home with the exact same enthusiasm you once demonstrated, and will resolve to buff it and paint it blue, and the cycle will continue. Big Magic is like a DIY Pinterest project, but about life itself. It is ultimately designed not for people who would like to think of writing as a profession, but for those who can afford to dabble in it. What Big Magic promises is akin to something you might find for sale on Etsy, to be recorded on Pinterest: a tiny mason jar that is also a snowglobe, a wishful, frozen fantasy of what the writing world might look like. Photo by Timothy Greenfield-Sanders, provided courtesy of Riverhead Books. Yasmin Nair is a writer, academic, and activist in Chicago. She is a co-founder of the radical queer editorial collective Against Equality and the Volunteer Policy Director of Gender JUST.